Mobile application My Movies is specially designed for creating home media library catalogs. With it, you can easily add movies to the database, and get information about them from the Internet developer service, which contains data on more than 800,000 films released on DVD, Blu-ray and HD DVD for various countries. It is convenient that the collection view can be configured as a list, a virtual shelf or CoverFlow. For each film, an overview is automatically added. You can see a configurable list of actors with links to roles in other works. Also, you can find audio tracks and subtitles for non-localized movies by the names. There is also a convenient view of the trailers through the built-in player. The program has an advanced filtering and database search. The free version supports up to 50 movies and 10 items in the release lists. Netflix is a mobile localization of the most popular service for fans of television series and films, broadcast on TV. Watch your favorite movies anywhere and whenever you like. With the app, it’s much easier to watch the world’s premieres. It isn’t necessary to search long for the episodes in the network, to be upset because of poor quality, broken links and poor translation. Everything you want to see is here on your mobile. Dozens of genres, thousands of titles, instant access and always excellent quality. Once registered, you can watch anything you want on any device: TV, tablet, Blu-ray player, game console (the list of supported devices can be found on netflix.com). In addition, when you start viewing on one device, you can pause playback at any time, and continue watching from another device. Make your own movie lists to watch films in your free time! Download Movie Collection application to manage your personal films library. The app has a free version which is limited up to 40 entries. You can expand the possibilities by purchasing the addon ‘Movie Collection Unlocker’. The application is convenient to use and has a clear interface. You can add films by title, keyword or with a barcode scanner even. You can create several lists at once and move entries between them. Once you’ve watched the movie, you can mark it as seen. 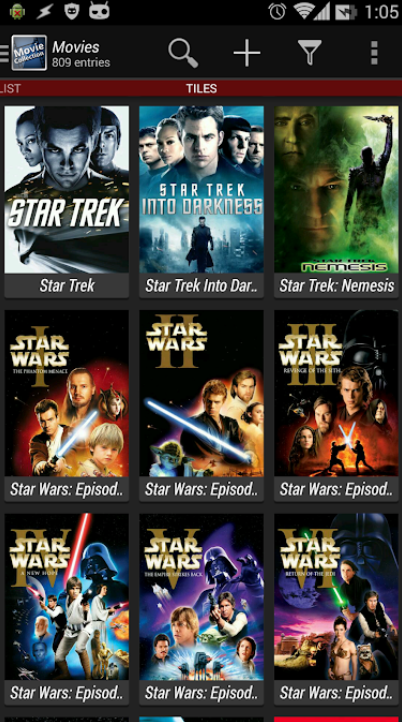 Organize your movie collection with this simple but still amazing application! IMDb Movies & TV is a mobile client for devices running the Android operating system. In the application, you can find detailed information about a large number of films and TV shows. Log in to the service using the credentials on the Facebook network – authorization will help the program remember your preferences and offer the user current news more accurately. You can add movies and TV shows to your Watchlist and rate what you’ve already seen. This program is able to turn a mobile phone or tablet into a real database – full and constantly growing. With its help, you can track the development of the film industry, read reviews of other viewers who have already seen the film or TV show. 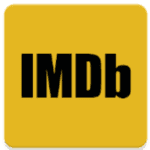 IMDb Movies & TV will be appreciated by users who are keen on the cinema world. This kind of encyclopedia of the film industry contains a lot of interesting information. The application requires an internet connection. The user interface has a stylish design. Everything is very compact and intuitive. Each of us has his own collection of favorite TV series, right? And the application SeriesGuide makes it possible to make your own movie collection – by searching for a variety of serials you can add everything you like to the archive. Soft gives us a huge selection of serial products. When you open the page of the desired series in the application, all the most detailed and necessary information about it will be presented. Of course, the most important part is the status: you can always see if the series has ended or is still going on. There is also an opportunity to read about other details: the time and days of the show, the channel, the average rating based on the opinions of users of different film resources, a brief story synopsis, genre, actors, average duration and the date of the premiere. An integral part of any series is the series itself – and we can get acquainted with the seasons of the series, the series included in them, the title and an intriguing description. As you visualize the video format of the series, you can mark all series as viewed. SeriesGuide is a convenient software, which has all the necessary information which is associated with the series. Except for the series … But they can also be found elsewhere, and if you need to monitor the show and learn the current and constantly updated information, then SeriesGuide will help you. Hobi is a simple tool to discover trending TV shows and create your own collection. Now you will be aware of what’s trending on TV at the moment and follow the most interesting shows. Hobi always keeps up to date with what new and when appear on the air. If you configure notifications, the program will notify you about updates before or after the premiere. The service allows you to watch trailers, read news and articles about future movies and TV shows in a convenient mobile format. MyShows js exclusively devoted to serials. In addition, this isn’t a source of news and articles, but a simple and convenient tracker that allows you to track your progress. Using the application, you can find the descriptions of the series and the names of the series. There is also a rating of all shows based on popularity among the participants of MyShows. Each user can note how many episodes of series he has already watched, as well as TV projects for the future. 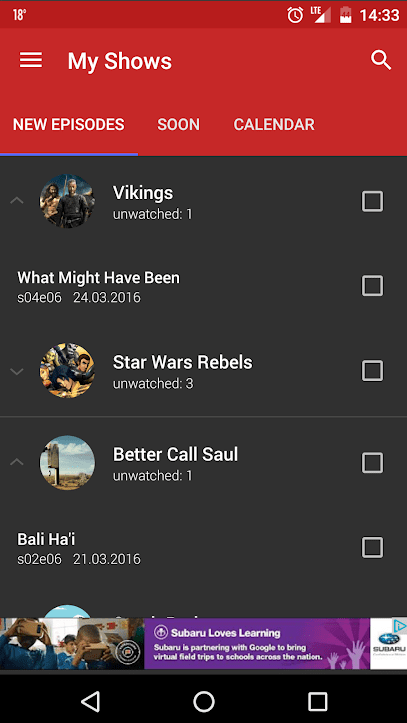 As a result, the application shows the number of new and watched episodes in each show along with the time spent watching. 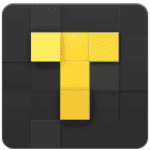 In this free application, you can easily monitor your personal viewing progress. 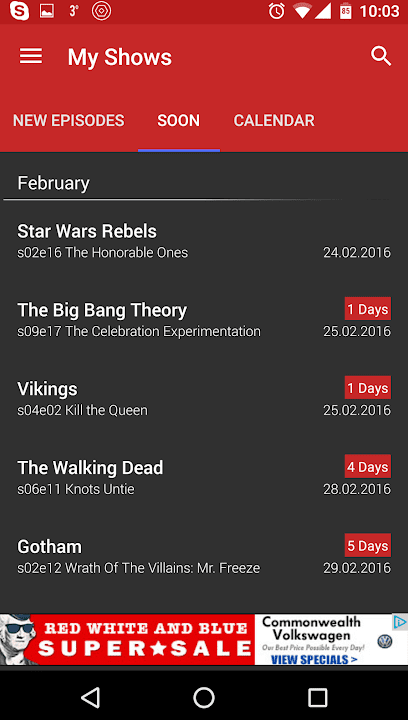 For each selected series TV Time displays the list of episodes that are left to watch. To keep this list up to date, you only need to mark episodes after watching them. For the most meticulous users, there is a statistics of time spent on serials. At your disposal, there is a calendar with episode release dates. If you configure notifications, the program will notify you about updates. An excellent solution for those who watch the series as they are released, so as not to be afraid of spoilers on the web. Among other things, TV Time is a cloud catalog, with which you can gather information about already loved TV shows and find novelties to your taste. You can read a brief description of the series, follow the ratings of other users, view the photos of the actors. The app also makes recommendations and displays lists of serials ranked by rating and genre. 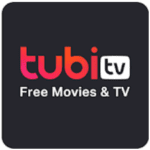 Tubi TV allows watching movies in HD quality for free. The content is updated weekly. The main task of this revolutionary tool is to provide viewers with a wide, and most importantly, quite a legal choice of free movies by creating a special subscription. Of course, there are paid movies in the application, but this is basically an exception than the rule, especially after some time and they are automatically redirected to freely viewable categories. The interface of Tubi TV is structured in such a way as to allow the maximum use of its broadest functionality – make up themed collections for further viewing, leave comments on the watched films and read the reviews of other viewers. By creating an account, you can use the application’s features on any device, since there is a cross-platform and full synchronization of all user settings once selected by the user. 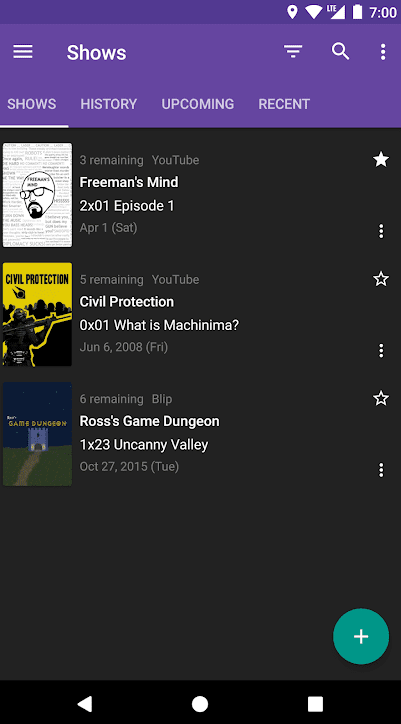 Google Play Movies & TV is a popular service for watching TV shows and movies on your smartphone or tablet. Using the application, you can quickly find and mark your favorite movies / TV shows. Everything is simple. You should sign in to your Google Play account and then, it will be possible to create your own libraries. You can also download the desired movie and watch it at any convenient time, even if you are not connected to the network. 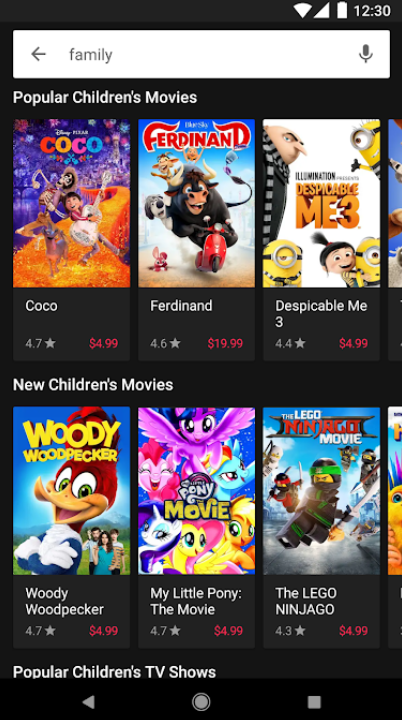 With Google Play Movies & TV, TV users can rent or buy movies and TV programs forever, choosing from the wide collection offered by leading Hollywood studios. You can download movies in offline mode. Get hints about actors and songs while watching and enjoy the movie art!